We now embark on our float down Meander Canyon on the mighty Colorado River (in past times known as "The Grand River"). 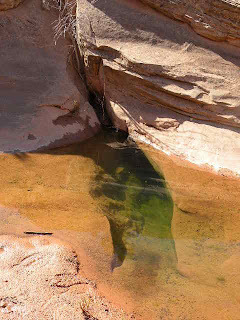 This leg stretches from Moab to Spanish Bottom, a total of 65 river miles. 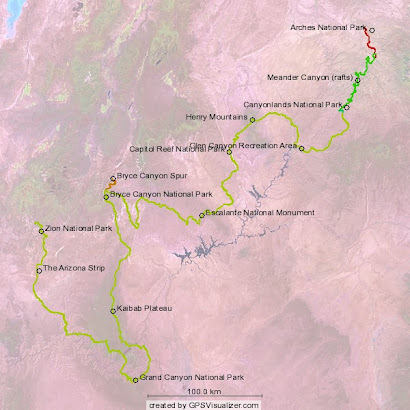 The last 31 miles will be within Canyonlands NP. Our mode of travel will be in 'packrafts', small one-person inflatables designed to carry a hefty drybag on the bow. Whether this will be comfortable, or even feasible for such a distance, is still unknown and this has been nagging at the back of my mind for quite some time. We bid our final farewells to the eclectic little town of Moab, Utah, which has been our home base of sorts for the past week. We stayed in the house of Dave and Kay McLean, who graciously offered their house to us even while they were away on their own adventure. Having a warm home, with its odd but interesting collection of VHS movies and excellent natural history books, kept our spirits up for the journey ahead. Jeep Week was in full swing in Moab this week. I have no idea how this extravaganza/fiasco evolved into what it currently is today, but it surely deserves a comment here. As a boy growing up in Durango, I remember exploring the high roads above Silverton in my dad's trusty Scout (the early International Harvester variety). Flesh-colored and monotoned with absolutely no extras or options (even lacking that necessary gear ratio for a comfortable highway drive), this vehicle was the most humble of servants. And that's exactly what it was-- a vehicle to explore the timberline country of southwestern Colorado. In fact, the only modification ever performed on it was the extraction of the back seats and the installation of an unsightly green bench seat bolted to a large plywood base. This was performed to accomodate the need for extra seating when my younger brother became old enough to go jeeping. My dad, a transplant from Decatur, Illinois, was far more interested in "going up to the high country" as he put it, than engaging in any sort of this machine-worshipping nonsense one sees out here in Moab these days. Armed with a simple rangefinder Petri 35 mm and humble Scout, we all explored and photographed the old ghost towns and high passes of the San Juan mountains long before the letters ATV were ever strung together. Don't get me wrong here, I'm not completely anti-4X4. I respect the old Land Rovers, Toyota Land Cruisers, and especially the Willy's jeep pick-ups. Beautiful machines in their own right. But I have no reservations about bitching at the mob-mentality of Jeep Week in Moab. At the ever-popular Moab Diner, the t-shirt of one super-charged jeep freak read "Life begins where the pavement ends". Given that we modified our trip to replace the Lockhart Basin hike with a packraft float into Canyonlands, initially to avoid the motorized parade of metalized manhood extensions, my inner t-shirt read "Life begins where YOUR jeep road ends", that being the G-rated version. We finally hit the river today after yet another episode of scrambling and rearranging gear. It dawned on us earlier in the day that this was our final opportunity to decide which gear was to proceed with us for the remaining 800+ miles of the trip. So it seemed the decisions were more crucial than before and this didn't help with the stress levels. Adding to this was the potentially disastrous outcome that this packraft idea was doomed to failure from the start. Would these tiny little floatables buckle under the 50 lb. weight of the drybags plus our own bodyweight? The moment of truth was very close now. We put in near The Portal, that rather spectacular gap in a huge cliff face through which the Colorado River lazily feeds itself into the canyon country beyond. After taking some time to inflate the rafts and the air matress floors, we packed the drybags, carefully sealed them, and lashed them to bow. Nervously squeezing into the rafts and sealing up the spray skirts, we finally launched these tiny crafts into the chilly, muddy waterway to Canyonlands. To our great relief, the rafts seemed perfectly content to float high on the current. They were maneuverable and even a bit on the comfortable side. Stress relief! Now we just hoped the weather would clear up for the long paddling miles ahead. Still, even the cloudy and windy conditions didn't dampen our spirits as we floated past "Wall Street", where we counted six different climbing parties ascending various cracks up the famed monolith. The road on the left side of the river eventually peeled inland so only the parade of heavy trucks to the Potash salt mining plant remained on our right. Maybe we will finally shed the last of the motorized distractions tomorrow. We eventually pulled the boats out on a sand bar across the river from the roadway. Although an occasional loud truck would blare by in the night, the anticipation of our second day of 'packrafting' kept things on the up and up. Sand, sand, sand! It looks inviting and soothing on a post card, and so it does floating past the numerous sandbars on the Colorado River, but if you camp on it, it begins to insert itself into every aspect of your daily life. Small price to pay, really. This was just too cool to wake up on the river on our own private sandbar and ready our transports for another mellow day of floating and paddling south into Canyonlands. It didn't actually turn out to be so mellow. Shortly into our paddle, the sky became ominous as a thundershower crept its way up the river. All we could do was photograph the calamity as it approached, and when it did hit us, it hit hard. The rain covered the lenses to my glasses and I was half-blinded as I tried to steady the boat to run parallel to the current. Wind-whipped waves struck the boat broadside and reminded me just how laterally unstable are these little crafts. I began to gather just how unfortunate it would be if one or both of us were to flip in the cold deep muddy waters of the Colorado. But, as fast as it had descended, the storm moved out and was quickly replaced with sun, warmth, calm waters, and Caron's claim that she was enoying every minute of the tempest. We pulled out at the Potash boat launch to use the last available toilet facility. This would also mark the last of the motorized vehicles running alongside the river. We noticed a park ranger had pulled up to use the restroom so we decided to ask him if he could authorize an extension of our permit for Canyonlands, given that we were a bit behind in our schedule. It turned out he was a Utah state trooper but he did not let that stop him from blindly advising us on our 'permit problem'. Leaving the Potash launch, we were finally beginning to feel emancipated from the sounds of the motorized world when we noticed an occasional drone of raging engines in the distance. This would be Jeep Week, of course. Many of the off-road routes run next to the river. How greatly demoralizing this was. How long was this going to take anyway? About that time, a low-flying helicopter came in from the west and then decided to circle us again even lower for a better look. "Hmmm.... must be those OTHER individuals on yellow packrafts floating down the Colorado River in clear violation of their permits whose dates don't match the locations that we're looking for". So they flew away. As soon as they had departed, we noticed the sound of power tools humming along in some sort of housing structure off to our right. Well, damn, we weren't in Canyonlands yet and still on BLM land so I guess this was allowed. Something we didn't really expect however. Toward the end of the day, the sounds of jeep engines, low flying aircraft, and industrial machinery had all but vanished. Finally these little rafts were drifting quietly between huge canyon walls where the curious call of the canyon wren was now the most audible feature. We pulled up on a sandbar island close to the NP boundary and managed to set the tent in a patch of willow trees on the island's interior. Solitude was finally at hand. Today was a superlative day on the river. Everything seemed exactly right and just what one would hope for on a trip like this. Upon our departure from the island, a great-blue heron glided gracefully onto it as if it had been forever waiting for the pesky humans to vacate. The sun was in full shine amid signs of stable weather as we finally passed into Canyonlands. With new and staggering geological formations around every bend in the river, we moved downriver with increasing anticipation. We saw three great blue herons altogether, an osprey, avocets, and eventually became quite amused by the antics of the Canadian geese which are quite numerous along the sandbars here. We watched as one gander challenged another for ownership of the sandbar. My educated guess is that the gander who maintains quality river territory, perhaps measured by security from nest predation, will get the highest number of interested females. One challenge escalated to the cliffs on the side of the river opposite to the territory in contention. There it played out as a ritualized escalation of physical confrontation until one gander finally flew away in retreat with an astounding vocal lashing by the winner. The echoes down canyon made it seem like more than one goose was doing the scolding. Most amusing indeed! Progress in terms of mileage is better than one would expect in these little rafts. I've been running my gps all day and taking note of the speed, total distance, total time stopped, and average speed while moving. There is no whitewater so far on this stretch and only occasionally is there a swift current. Depending on the location on the river (e.g. an inside or outside bend), the existence of submerged sandbars, and the general width of the river channel, pure drift alone will yield 1.5 to 2.2 mph. Paddling constantly will increase this to 4.0 mph. Since we are paddling intermitently, but being consistent about it, we are achieving a moving average of about 3.2 mph. This is better than one can do hiking this canyon, where moving averages are typically 2.8 or lower. The difference comes from the fact that we are still moving when resting (i.e. not paddling). I think I like this packrafting concept! Across from Lathrop canyon, we pulled up on a tamarisk-lined beach for lunch. Momentarily leaving the river corridor, we visited some ancient native ruins in the cliffs high above the river bottom. Displayed prominently on the sandstone were the outlined hands of the family that had lived there. It's easy to conclude how peaceful their life must have been. On the other hand, this was a life without food markets, convenience stores, packrafts, antibiotics, and red rock vacations. Life surely was different for the ancients. I still like to think they occasionally looked around and felt satisfied about their location. Tomorrow will be the end of our little river adventure. We will hand over the drybags to one of the Moab-based river tour companies at Spanish Bottom. The gear will work its way back to Moab on one of the motor boats that plow up and down the river once or twice a day. Although this commercial enterprise is a bit disruptive of the quiet solitude we are now getting on the river, we are going to use it to lighten our load significantly. Plus, when the boats come through, they generate a 5-minute interlude of class 1 rapids that are quite fun to play around in before the river returns to its slow meandering ways. We stopped to set up camp on yet another 'private' sandbar only 16 miles from where we would resume our foot-based travel through Canyonlands. End: Colorado River, mouth of Red Lake Canyon, Canyonlands NP. After an early breakfast of grits with sausage and cheese, we readied the rafts for the final day on the river. By now we were getting fairly adept at fixing the dry bags onto the rafts. We first lay the empty backpacks flat onto the bow, plop the dry bags loaded with all other provisions on top and lash this to the raft's grab loops. A smaller drybag containing camera gear, a water bladder, gloves, sunscreen, and related items is then secured to the main drybag lashings. Finally, my gps goes into a small plastic dry bag with a see-through window to keep track of the speed and distance travelled. It's all a very compact arrangement and squeezing into the raft often proves a bit challenging. However, once we manage to get the spray skirt velcroed shut, we begin to feel self-contained and very mobile. The best time is made by paddling the crafts close to the inside banks, which also increases the likelihood of seeing animals up close. Shortly into the day, we entered a section of river called "The Loop", whose 5-mile section of double hairpin loops yields only a single mile of downstream progress. Thereafter we re-entered the Meander Anticline where the course of the river follows the apex of strongly upwarped sediments. The upwarping was thought to be caused by vast and deep deposits of salt, forced into a plastic phase and squeezed upward by the overbearing weight of thick sandstone deposits on top. I find it very soothing in a way that these amazingly intense physical forces, occurring deep beneath the earth's surface hundreds of millions of years ago, would later determine the course of this great river. Having this understanding and, at the same time, looking up through thousands of feet of compressed sediments, provides one with a tangible link to the geologic past. Linking time and space is one of the great triumphs of science. Of the many animal life forms roaming the earth at this time, one was ancestral to humans who would eventually figure all of this out! It's indeed exciting to be a product of this great earth. Further downstream we encountered the only set of rapids on this stretch of river, created when a massive chunk of canyon wall slid into the river and narrowed its channel. Although the rapids were only of the very manageable 'class 2' variety, they made quite a racket from a good distance upstream. Nonetheless, I never felt cheated by the absence of more technical whitewater as I was too interested in completing this raft trip without a major incident. Shortly after negotiating 'The Slide', we found ourselves at the famous confluence of the Green and Colorado Rivers. A huge sandbar lay beneath only a few feet of water just beyond the point where the Green yields its huge volume to the Colorado. We thought of the unique photo opportunities by standing up in the middle of these two great western rivers, but decided it would only look cool from the confluence overlook more than a thousand feet overhead. We finally made it to Spanish Bottom, a wide canyon area created by the dissolution and removal of an ancient buried salt dome. We could see our take-out point-- the Prommel Dome, a massive gypsum plug associated with deeply buried evaporite deposits. This marked the end of our four days on the river. Continuing from here on the packrafts would be suicidal as Cataract Canyon, known for its hazardous drops and thoroughly challenging whitewater, lay just beyond the take-out. We felt refreshed and ready to return to a leg-powered exploration of the canyons high above and distant from the Colorado. We deflated our little rafts, cleaned them the best we could, and packed them away into the dry bags. After a quick dinner, we dozed off to the distant roar of Brown Betty, the first big drop of the mighty Grand in Cataract Canyon. I am here back in Moab after arriving 4 days earlier, still uneasy and nerve-shattered from the great escape from southern California. Since then, we walked our first leg of the Hayduke, a 30-mile trek from the northern boundary of Arches NP to its southern boundary on a highway just outside of Moab, and finally through town to stay at Dave and Kay’s house (Caron has some great friends in this little corner!). After the obligatory photos at the park boundary of two eager trekkers putting on their packs in earnest for the first time, we waved goodbye to Caron’s friend David Morgan who was nice enough to deposit us there. We made quite a few physical and gear-related adjustments as we walked the first 7 miles of park road, but the largest adjustment for me was purely mental. I have done the PCT hike and I knew this moment was coming. In essence, it goes like this: having sacrificed like hell to get to this point, walking through a natural area on your own as the ultimate nomad, just what are you supposed to be thinking? There is a tendency to reflect on the magnitude of your preparation and ask “well, so where’s the show?” as if expecting equal, opposite, and immediate recompense for your backlog of effort. Yet, for all the months of dehydrating food, map planning, gear acquisition, food caching, and a generally monotonic disengagement from society, we are left hiking along a lonely windswe pt road with no company but a large Swainson’s hawk hunting in the distance. It seems very anti-climatic indeed, and a big problem at this point. But slowly, as the miles drift on and the views begin to stretch out before us, we begin to see that this is exactly why the sacrifice was made-- this is exactly why we are now here. We stopped to eat lunch, our first official food on the trail, near the end of our road walk and before the first of many sudden and seemingly illogical transitions to cross-country travel. Before doing so, we made mention of the general nature of the back road travelers through Arches. Many were young males in tricked out 4X4 rigs speeding and sliding through the deep sand. I made sure tha t when I heard one of these yahoos coming up fast that I got in the middle of the road so as to force them to an immediate stop. Why not remind them that this is a national park? It seems the park service, at least in Arches, has caved into the failed philosophy of “multiple use”, championed by the forest service many decades ago. National forests were parted out to everyone under this idea­ a distinctly humanistic policy that ignored long-term preservation of the forest and its inhabitants. But national parks, by their own mission statement, are supposed to be different. Allowing use of the back roads by street-legal motorcycles and 4X4’s succeeds in keeping those awful ATVers away, but clearly diminishes the natural history experience and the solitude of the well-intentioned visitor. We followed a border fenceline from the road down to some sandstone fins where we had to lower down the packs over the lip of a small amphitheater, whose drainage we were now entering. Caron proved herself as an adept rock climber as she descended first and helped me transition down. I think she has much better confidence in her climbing skills than I do. This revelation came at a good time as I sensed she was getting frustrated by my faster hiking pace. The drainage led us out to the western border of the park, where we met a park ranger on a motorcycle. I briefly complained about park vehicle policy in the form of naïve questions and then we slipped over to BLM land to spend the night, ­exhausted but relieved that we had finally made our start. We slept nearly 1 1 hours-- ­talk about needing some R&R! Caron wasn’t hungry (a very strange deviation) so we decided to continue descending the drainage we left last night until we encountered water. As we were slowly funneled into the ever-developing Courthouse Wash, we began encountering ‘pothole water’, but not of the appetizing variety. We got our first taste of negotiating pouroffs-- ­sudden and often impassable drops in the wash bottoms. Water erosion, although infrequent as an annual occurrence, over time produces sudden but rounded drops. The pouroffs we encountered weren’t very magnificent and were easy to walk around. But they simply pointed out that walking continuously and unimpeded down these desert canyons is not to be expected. The more challenging pouroffs will come later in the next leg, where the canyons are much deeper and the seasonal water flow is heavier. We even experienced mini “slot canyons” in upper Courthouse Wash. The more magnificent varieties are also ahead of us. ill-fated channel that ended in a blind drainage. 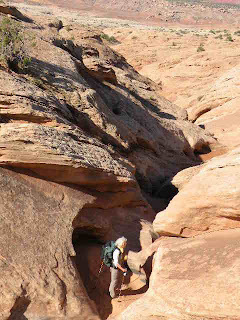 However, beyond thisemerged a well-worn trail above the flow channel that greatly facilitated movement down the wash. We followed this trail another 7 miles out of the canyon to the southern boundary of Arches, all the while losing and rediscovering our friendly trail countless times. Although we felt like this passage had kicked our butts, we emerged with a sense that we had been initiated, with mercy, to the unique tribulations of desert canyon travel. We were rewarded with the pastoral air of a desert creek bottom amid the grandeur of the towering geology overhead. We’ve earned our rite of passage into the next leg­: floating the mighty Colorado down Meander Canyon on rafts. We’ll turn over the physical abuse to our upper bodies while hoping our lower halves have time to equilibrate with the upcoming demand. Escaping from the confines of society to embark on something as grand as the Hayduke Trail requires an overwhelming amount of concentration. Ironically, in order to effect one’s escape, those aspects of society that proved so intensely mundane and which, in part, motivated the escape in the first place, must be now considered top priority. Pay this bill, pay that person, set up payments for future bills, clean the damn house (the whole damn house!). In short, you must prepare for continuing membership in society even while in absentia. This is just one of the contradictions that we face when we aren’t really escaping for that long. We could just say “screw the entire thing”, but something tells me this wouldn’t produce the best outcome. We will be tethered in many ways on this hike. As we walk through canyon after canyon in blissful desolation, we are also walking a line of balance between temporary isolation and return to a permanent society. This optimum was beautifully elucidated by the story, Into The Wild. You should take in this movie or read the book if you haven't had the chance. Add to this confusing set of obligations the enormity of preparing for a 75-day hike through North America’s wildest canyon country, and you have the makings of a very stressful episode. In addition to the monotony and sheer exasperation of cleaning and moving both our apartments, we were pressed to get the resupply boxes packed and scheduled for shipment-- the dates for the national park permits being the main moderator here. In the end it took 36 hours longer than planned to accomplish this. We considered taking the first section through Arches NP out of the picture but this did not sit well from a philosophical perspective. Also, I figured that this trek through Arches, being described as one of the easier stretches of the Hayduke, would serve as an important initiation into hiking and navigating this terrain. And let’s not forget that we are really here to experience the beauty of the area not from the usual tourist’s vantage point. We ended up attending a 50-year birthday party for a good friend in Vista, and staying an additional 2 days at his house. The occasion was merely a good excuse for a reunion of sorts among the Ocean Beach crowd from 25+ years ago. Ironically, I was resistant from the start to attend the nostalgia party because of the ostensible intransigence of our trail schedule. Add a dash of reality and we’re there for the weekend. It was great to see everyone-- ­the reminiscing, drinking, and playing of bluegrass was a much better way to initiate our escape from society.